Product prices and availability are accurate as of 2019-04-19 14:28:17 UTC and are subject to change. Any price and availability information displayed on http://www.amazon.com/ at the time of purchase will apply to the purchase of this product. DFK961 Features: -Pump system. -Package contains: Controller, charger, two dual micro reed float switches, primary pump and backup pump, instruction manual (battery and acid sold separately). 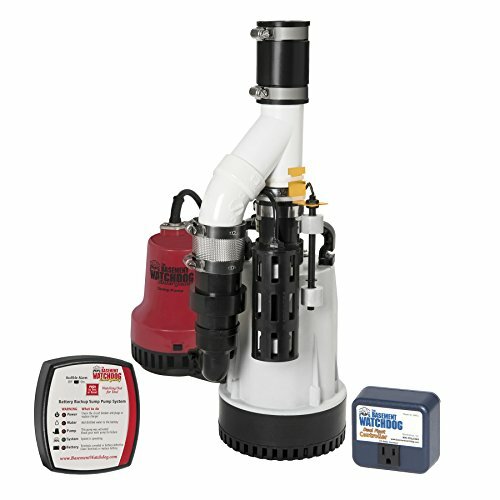 -Offers two combination sump pump systems designed to provide both primary and battery backup pump capabilities. -Primary pump will operate as long as it is receiving AC power. -Power is interrupted, or if more water is coming into the sump than the AC pump can handle, the backup sump pump will begin pumping automatically. -Backup system has unique monitoring features that diagnose a problem and sound an alarm. Hardware Finish: -Stainless Steel. Material: -Aluminum/Cast iron. Hardware Material: -Stainless steel. Number of Items Included: -11. Corrosion Resistant: -Yes. Frequency: -60 Hertz. Finish: -White . Generic Specifications: -Power supply requirements: 115 Volts AC. Dimensions: Overall Height - Top to Bottom: -17.75". Overall Width - Side to Side: -10". Overall Depth - Front to Back: -8.75". Overall Product Weight: -14.63 lbs. AC-powered primary pump operates as long as power is available Backup sump pump automatically begins pumping if the power is interrupted or if more water is coming into the sump than the primary pump can handle Combination sump pump system offers primary and battery backup pump capabilities User-friendly controller sounds an alarm, illuminates a warning light and describes what to do for easy maintenance Compact design fits in pits with diameters as small as 12 in.